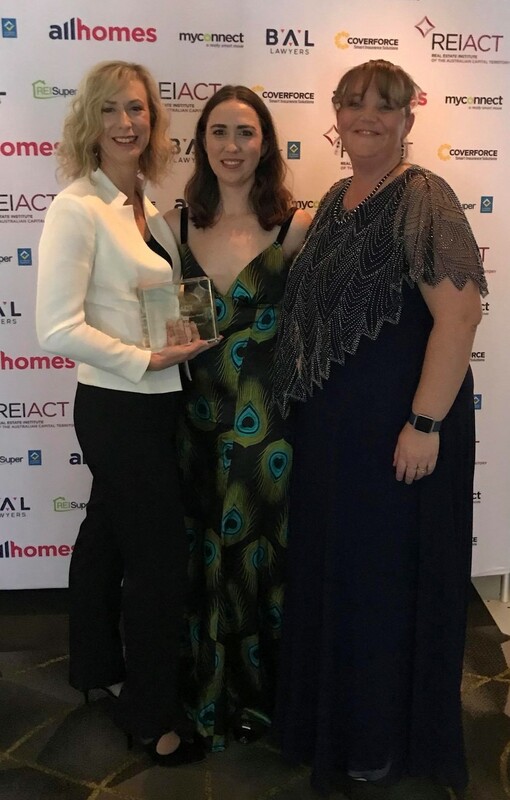 Peter Blackshaw Real Estate is still celebrating after a successful Saturday night at the Real Estate Institute of the ACT’s Annual Awards for Excellence. The Canberra real estate industry’s biggest night is held to celebrate and recognise top performers across the ACT. With a total of 7 awards, Peter Blackshaw Real Estate was certainly recognised as a top performer in the Canberra property industry. This year, the brand launched myonlineappraisal.com.au, a convenient 100% online tool which connects you with an experienced local agent for a personalised estimate of your property’s value. This innovative idea aims to provide consumers with a convenient, user-friendly method to receive a property appraisal. My Online Appraisal showed the Canberra real estate industry how using technology can enhance the client experience while still maintaining a personal connection. This pioneering initiative led to the brand being presented with the Marketing & Communications Award, given to an agency whose work benefits both consumers and the real estate industry as a whole. Narelle Casey, Peter Blackshaw Franchise Operations Manager, believes My Online Appraisal has been so successful because of the brand’s commitment to providing excellent customer service while meeting the increasing needs of consumers and the changes in technology. “We know people are increasingly time poor and wanting information quickly and easily. We wanted to create a solution for people where they had the benefit of an online experience but are still given access to a real person with real local expertise. “Most websites offering an online estimate use an automatic algorithm, there’s no consideration to renovations or other ways that have added value to your property. With ‘My Online Appraisal’, we’re still connecting people with experts, not an algorithm” says Narelle. The brand was also awarded the Community Service Award which is presented to an agency that makes a positive impact and outstanding contribution to the Canberra community. This year alone, the team at Peter Blackshaw has donated over $185,000 to local charities and organisations. “The community is part of the core values of our brand; each person within Peter Blackshaw shares the same commitment to community and the desire to give back to a city that has helped us to become so successful” Narelle says. For 4 years, Peter Blackshaw has had a strong relationship with local organisation, ‘Stella Bella Little Stars Foundation’. Stella Bella aims to brighten the lives of children in the ACT who are living with serious and long-term illnesses. This year, the group has raised $70,000 for Stella Bella which helps them to continue delivering much needed support and assistance to ill children and their families. A memorable moment for Peter Blackshaw this year was the Resplendent Ball, an event organised by the ever-inspiring Rhys Summergreene of Peter Blackshaw Tuggeranong. Rhys, who is battling a highly aggressive from of cancer, looked beyond his own struggles to organise a ball to fundraise for Freyja, a six-year-old girl who needed funds to travel overseas for life saving treatment. With the support of Peter Blackshaw and the wider Canberra property industry, Rhys raised over $75,000 for Freyja and her family. Narelle says community service is not only about donating money but becoming actively involved in the community. “Our people are involved in their local areas in every way possible, from volunteering at school events, sponsoring sports clubs or donating their time, we believe in contributing in any way that’s possible. Community is what drives us, and I know our team members are very proud to say they belong to our network because of this” says Narelle. Narelle Casey and Rhys Summergreene with the REIACT Community Service Award. 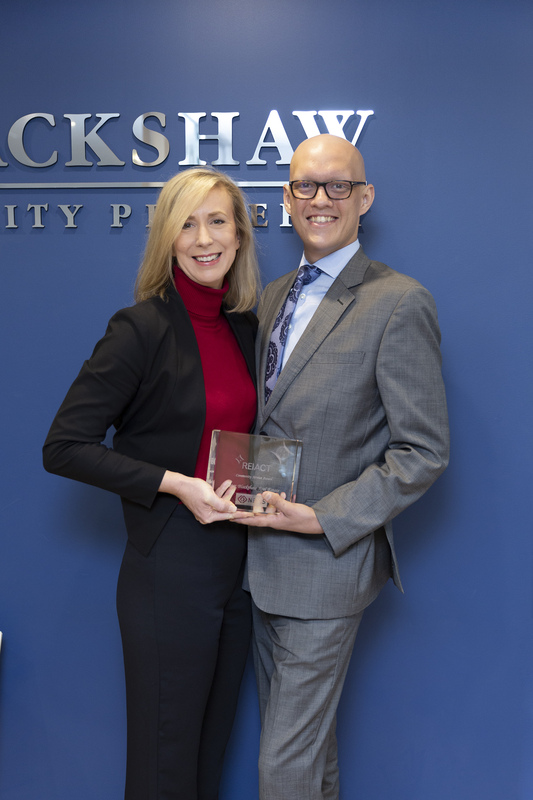 While the Peter Blackshaw team were celebrating their brand awards, there were also individuals within the group celebrating their own successes. 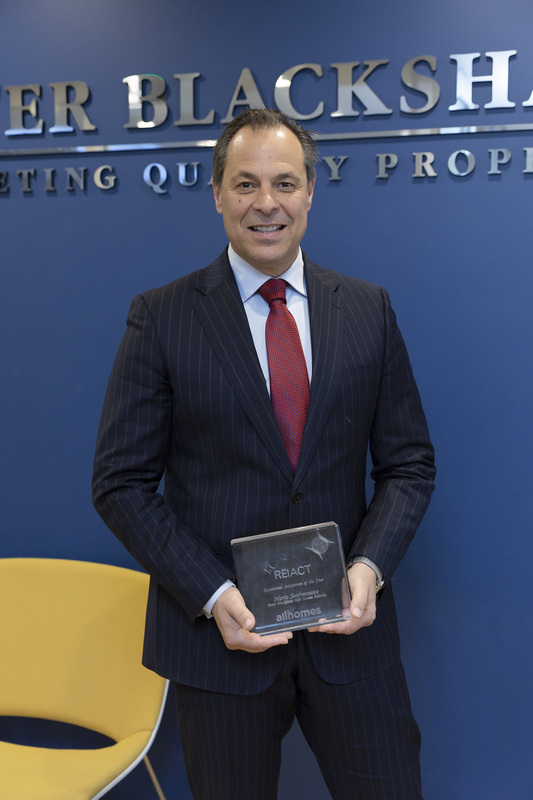 Mario Sanfrancesco won the prestigious Sales Person of the Year Award. This is a highly sought after award which each agent across the region aspires to achieve. Mario, ever gracious, thanked and accepted his award in honour of his close friend and local Canberran, Charlie Morella, who recently passed away after his battle with cancer. "I am humbled to win such an award, and am truly honoured to work with so many people and assist them in their property journey," says Mario. Mario has won the REIACT Auctioneer of the Year 3 time sin the past as well numerous other industry awards. Peter Blackshaw Manuka won Auctioneer Franchise of the Year, with their team member Jenna Dunley’s successful year continuing with being awarded the Novice Auctioneer of the Year. 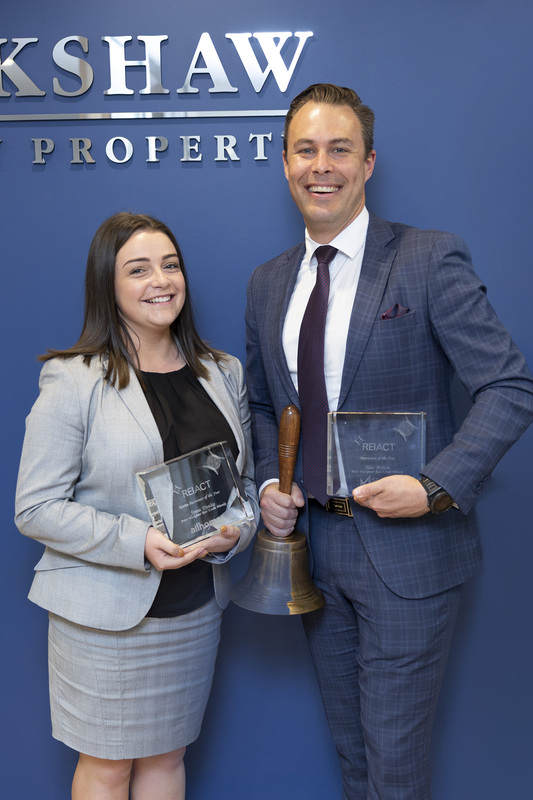 Meanwhile, Jenna’s colleague and mentor, Alec Brown, won Auctioneer of the Year and was also awarded the Allhomes People’s Choice Auctioneer of the Year, which is voted on by the Canberra public. According to Narelle, auctions play a significant role in the identity of the brand. “When Peter Blackshaw arrived in Canberra in 1988, he was a big believer in auctions and worked very hard to educate the industry and set the standard for Canberra. For us, it’s very special and rewarding that 30 years on it’s still Peter Blackshaw leading the way.” Narelle says. Peter Blackshaw Manuka Auctioneers, Jenna Dunley and Alec Brown. After such a successful year, Peter Blackshaw has no plans in slowing down. Narelle says the team will continue to invest in new technologies, training and their involvement in the Canberra community. “Having been so successful at this year’s awards we are encouraged to keep trying new ideas, implementing practices and delivering an even better client experience. For over 30 years, we have been at the forefront of the Canberra real estate industry and we plan to continue leading the way” says Narelle.